The cats are back! Did you miss them? I think she wants to go with you! I missed the kitties! Did they feel overthrown by the zombie chickens? For some reason, our cats go nuts when the suitcases come out. They crawl in and hide. They don't like being left behind. My kitties love suitcases too! 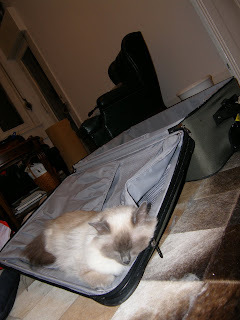 One of ours jumped on top of our suitcase after we got back from vacation and it was like he was saying, "I'm not letting you go anywhere without me again." How cute! Have fun on your trip. Cats are funny. One of my friends is having a baby and I bought her one of those chairs that vibrate and all that jazz. Well, the cat thinks it is his chair. The only thing is that it makes noise when you pull on the dangling things... The cat found that out the hard way! So cute cats and looking beautiful and lovely in this pic.